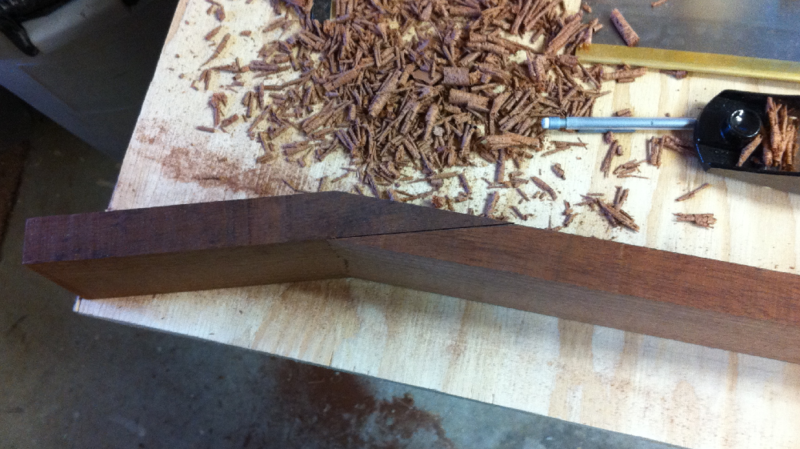 I made my neck out of a piece of sipo mahogany that I ordered from Stewart-MacDonald. I found it took be pretty easy to work with, it seemed to plane quite nicely and it was relatively easy to install an inlay into it. Building the neck wasn’t the first thing that I did, I actually cut out a full sized paper template of the body and then built a guitar work board as recommended by Natelson and Cumpiano, but I decided to group that stuff in with the next section so I’ll talk about building the neck first. 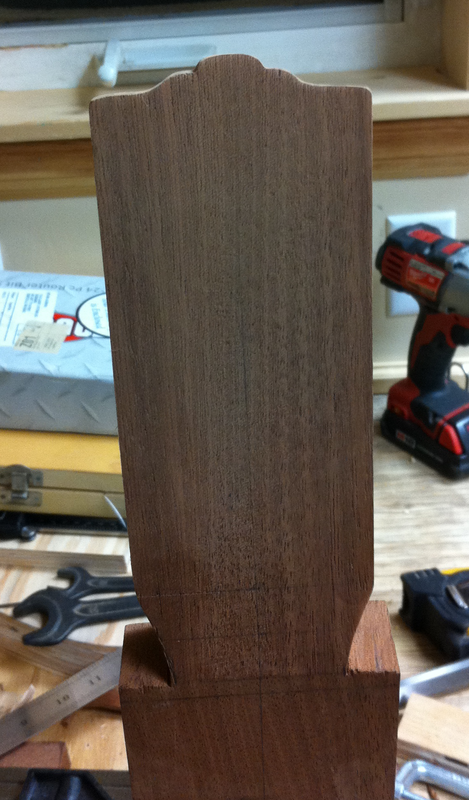 Initially I thought I wanted to carve the whole neck, headstock to heel, from a single block of wood. 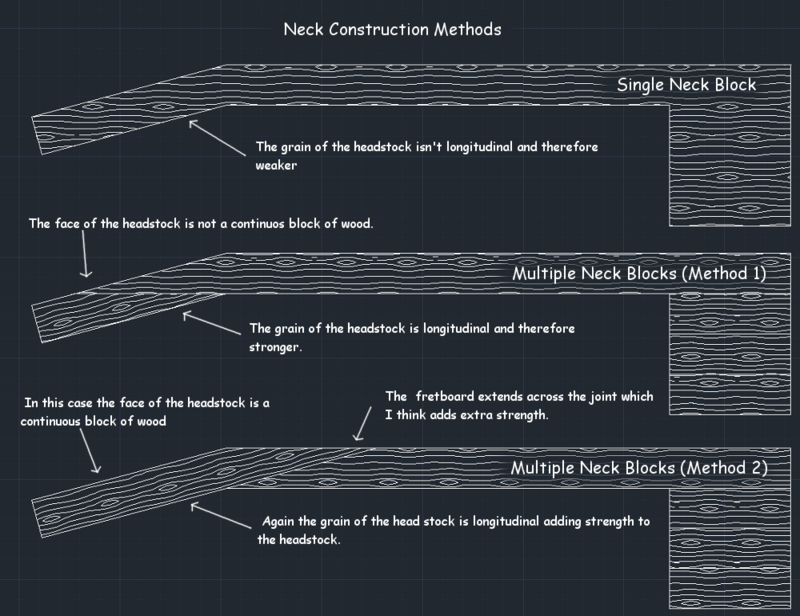 However upon reading the neck section in Natelson and Cumpiano’s book I soon realized that in the end by using a single block of wood I would end up with a weaker headstock because the grain of the wood wouldn’t be parallel with the headstock. So I decided to follow Natelson and Cumpiano’s suggestion and make my neck out of a thinner board and just laminate pieces together to make the heel and to make the headstock by gluing a piece on with an angled flat joint. I found its also much cheaper to use a thinner board instead of buying a big solid block of wood. Rather than gluing the headstock to the bottom of the neck which was the method used by Natelson and Cumpiano I decided to glue the headstock to the end of the neck as illustrated in the picture below (Method 2). I did this because I didn’t want to use a veneer to cover the headpiece and it wouldn’t have looked so good to have a joint right in the middle of the headstock. Also I felt the joint would ultimately be stronger with the fretboard extending across the joint, but whether or not that is true I don’t know. Measuring the headstock angle cut turned out to be trickier than I initially thought as I found that out the hard way. The problem originates in the fact that the headstock thickness is smaller than the neck thickness so in order to minimize waste that fact must be taken into account before the cut is made. Hopefully the picture below helps to illustrate what I mean. 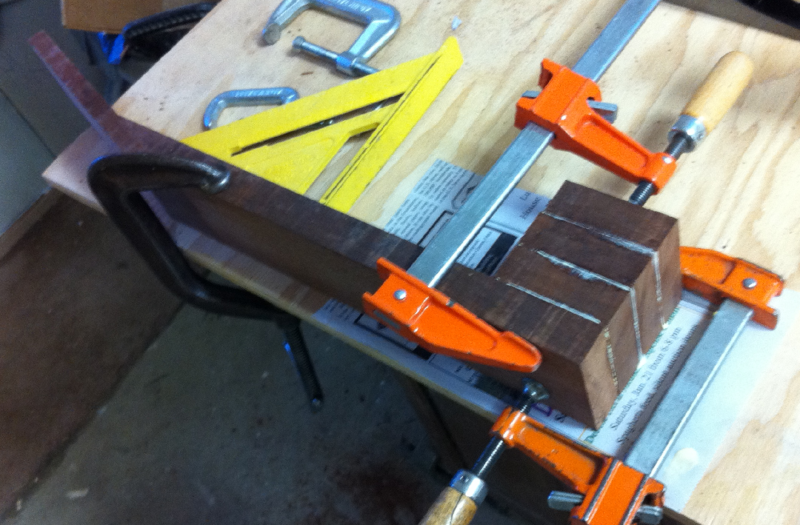 Unfortunately I had not considered how the neck length would change as I planed down the headstock to the desired thickness and so I had more waste than I would have liked, but thankfully I still had enough to complete my neck. Once I made the cut I clamped the two pieces together as suggested by Natelson and Cumpiano and hand planed them down to get a nice flat gluing surface as shown. I then glued the two pieces together, the result is shown below. Later on when gluing the fretboard to the neck I realized how important it is to make sure the joint is aligned with the neck so that the fretboard can be glued to a perfectly flat surface. 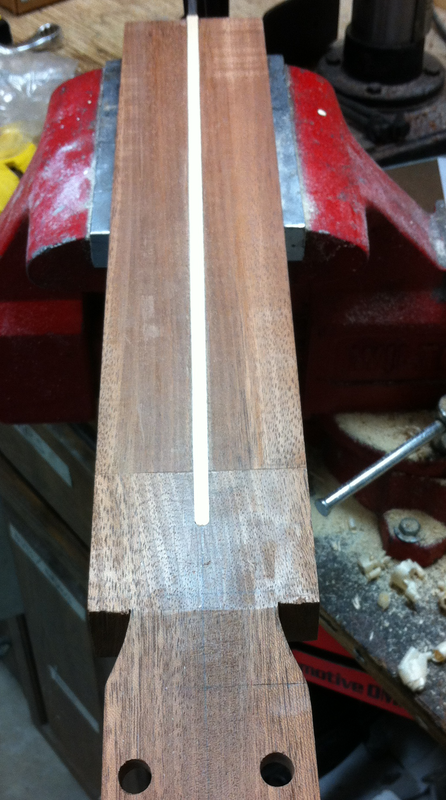 The headstock was then planed down to thickness and the heel blocked were glued on. The picture below shows how much the headstock was lengthened when it was planed down (or conversely how much the neck was shortened). 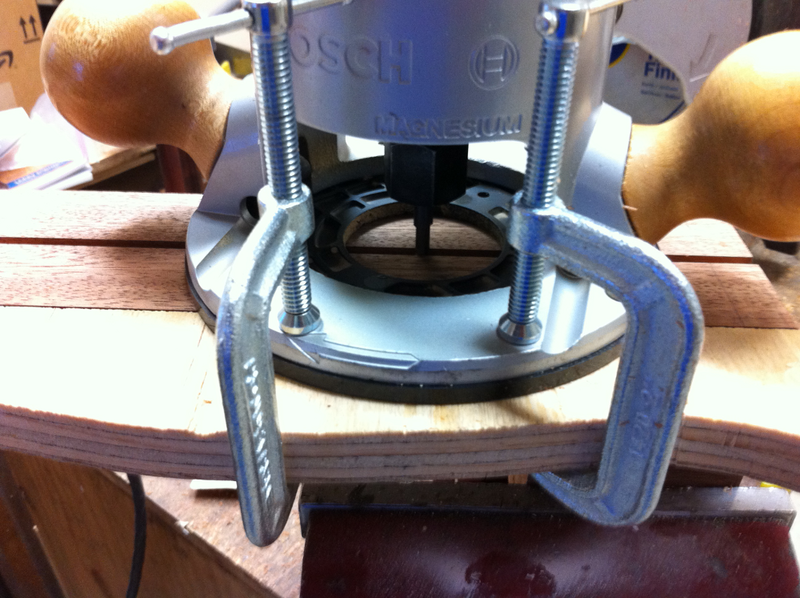 The outline of the headstock was then cut out using a coping saw (a band saw would have been great, but I managed). I drew the outline of the headstock on the wood using my CAD drawing as the guide, if I had to do it again I think I would just print out the full scale headstock outline since AutoCAD can basically print out a perfectly dimensioned drawing with a regular old printer. The finished cutout is shown below. I made the neck truss rod as detailed by Natelson and Cumpiano, shown below (I found it to be a very clever, simple and effective design). It wasn’t very difficult, while bending the 3/16″ steel rod I ended up tearing the metal, but thankfully I had access to a welder so I could just fix it. 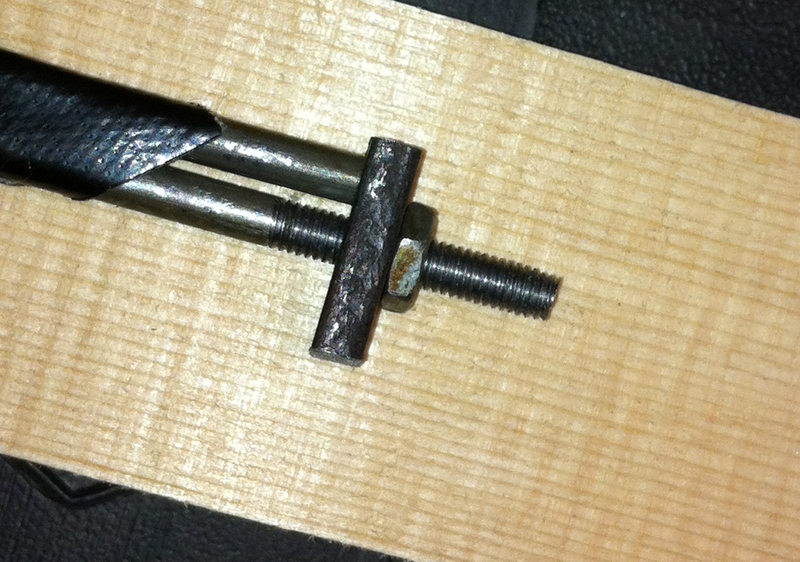 I also had access to a tap and die set so I could put threads on the rod. I started off wrapping the truss rod in gorrilla tape because I thought it would be strongest, but I decided that it took up too much room so I eventually settled on packing tape and that seems to have worked well. 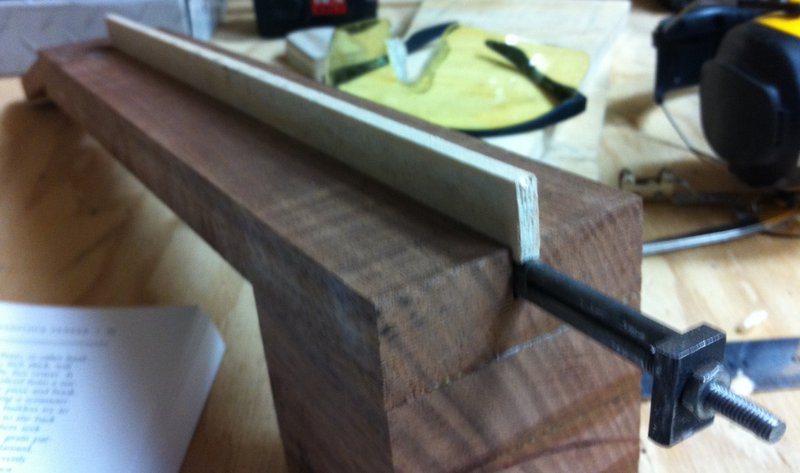 Then I routed a slot for the truss rod. I used a 3/16″ plunge bit so I needed to widen the slot slightly, to do that I took the advice of Natelson and Cumpiano and added strips of masking tape onto the router guide until I got the truss rod wrapped with packing tape to fit nice and snug into the slot. 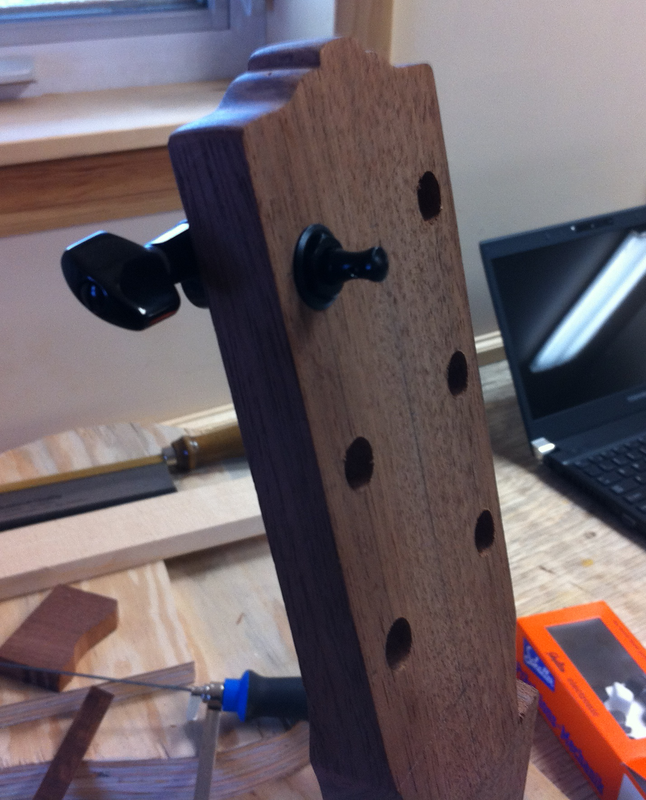 The slot was cut 1/2″ deep which left a little less than an 1/8″ of space from the top of the truss rod to the top of the neck, which is shown below. I used a strip of spruce to fill that gap. A strip of hardwood would probably have been better to use since it wouldn’t compress as easily as the spruce, but maybe not. Finally I glued in the filler strip of spruce and planed it down nice and flat to the neck as shown below. It was right about this time that I started to feel really really dumb. 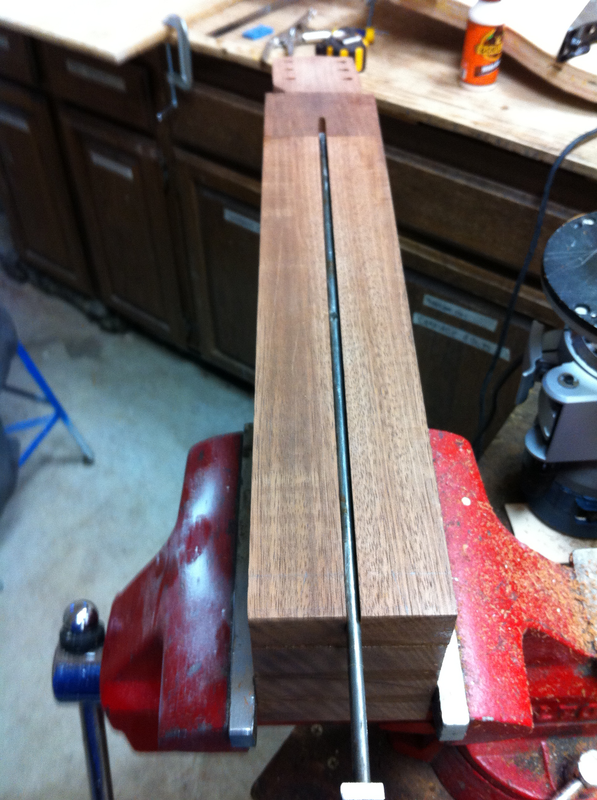 I had left the truss rod in the neck and I was afraid that it might have gotten glued in permanently and that would have been bad because I still had to cut the heel shorter to make the dove tail joint later on… but thankfully that was not the case, I was able to knock it out quite easily by clamping the end of the truss rod in a bench vice and tapping lightly with a hammer on the heel end of the neck. In this way I was able to insert and remove the truss rod when I wanted, so I was relieved and happy with that unplanned procedure. At this point I moved on to the construction of the body. In their book Natelson and Cumpiano took the next step of carving out the heel, but I decided not to carve the heel until I had finished the dovetail joint. Hi, what was the lenght of your neck.